Montreal In two years, the New York Times notes that there have now been seven actions involving fast food workers and demands for $15 per hour. The latest claimed to have held actions in 150 cities around the US with up to 500 arrested for civil disobedience, largely street blocking. The Times’ labor reporter, Steven Greenhouse, now puts the tab covered by the Service Employees at $10 million for this campaign, though I’m sure that’s “above the line” costs, not counting deployment of much more involving existing staff, offices, and operations, which is one of the ways a flag gets planted in this number of cities. Grant Williams, an old ACORN organizer in his youth for several years and a longtime SEIU organizer now, left best wishes for me the other day with Toney Orr, Local 100’s state director for Arkansas, when he was in Little Rock trying to expand the campaign from his home port of St. Louis. This is something that must feel like a walk in the park for Grant and right in his wheelhouse, and the number of times fast food workers from St. Louis pop up in these stories, indicates that he and his team are doing a great job. Someone from St. Louis was one of the 19 arrestees in New York City. Three of the eleven arrested in Little Rock were from St. Louis. Not sure how many of the dozen or so in Memphis. In fact, Missouri must be the real ground zero from this campaign since on the list of 150 cities on the www.popularresistance.org website a full 20 of the cities were St. Louis and Kansas City suburbs with a few other scattered sites in Missouri. Pine Bluff, Jacksonville, and North Little Rock were on the list of cities as well, because folks from those cities were part of the actions in Little Rock. Local papers recorded no actions in the cities themselves. Add Southhaven, Mississippi to the Memphis action on the credit list for the St. Louis team as well. An action in New Orleans included people from St. Rose, Luling, Harvey, and Slidell, all part of the greater metro area, so they were part of the 150 list as well. Three were arrested in New Orleans, two of whom were workers, and though Baton Rouge is on the list of 150, there were no reports in the Baton Rouge Advocate of any Baton Rouge activity. The Arkansas Democrat-Gazette reported that the protestors began in Little Rock at 8AM, and had been arrested and were back on the bus by 9AM, and headed to Memphis to continue their protest. The Memphis Commercial Appeal reported that a dozen were arrested blocking the entrance to a McDonalds on Popular Avenue in that city at noon, so they made good time, despite that construction past Forrest City. This roving picket line of sorts had managed to stay busy! From these numbers it looks like New Orleans, Memphis, and Little Rock are right at the epicenter of the fast food organizing with almost 10% of the cities where there are actions. Throw in the Missouri-based work and their 20 hotspots, and going up and down the Mississippi River we have more than 20% of the hotspots. Who knew? I was optimistic about the reports on homecare workers joining the campaign, and there was evidence that some spoke to the issues, as I predicted, in Illinois, but otherwise they were not part of the story, even if I still hope there may have been others that were part of the action. Don’t misunderstand me, if a fast food worker was from a city, then nothing wrong with claiming the city, but as an organizer, I know that someone passing through or picking up the bus someplace is not the same as having the location organized. But, when you get involved in the “claims” game of how many cities and how many arrests, it’s just a matter of time before someone starts counting the names and numbers to see if this is manufacturing or a movement, and when that happens the smoke and mirrors can cloud the strategy and workers and supporters get confused between what they know and can see versus what they had hoped was there. 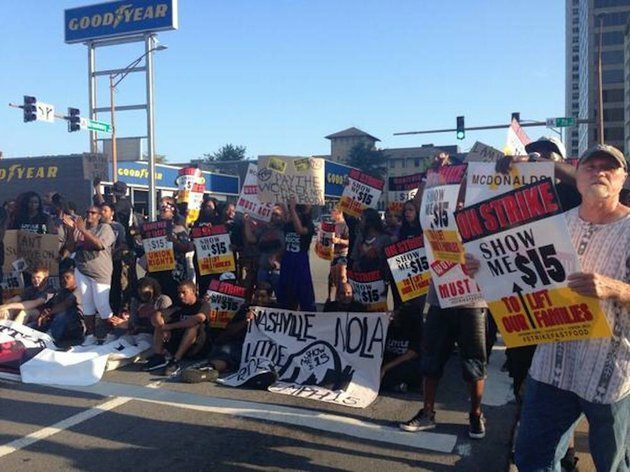 For fast food and other lower wage workers, the anger is real and the demands are just. We better make sure that we don’t get tripped up by the tactics on the way to putting together a winning strategy. Please enjoy Come from the Heart by Hard Working Americans Featuring Rosanne Cash. New Orleans Just maybe the publicity campaigns of the $15 per hour efforts by fast food and other workers are about to get serious. Steven Greenhouse in the Times reported that SEIU is claiming that “thousands” of the several hundred thousand home health care workers represented by the union are preparing to join upcoming actions and participate in civil disobedience along with fast fooders in advancing their claims. In and of itself this announcement doesn’t move the needle on the campaign, but what it does indicate is that the campaign might finally become very real if organizers and leaders are willing to broadly mobilize the half-million or more homecare workers under union contracts from Illinois to California, New York to Washington State and many places in between. The unionization of these informal, precarious workers over the last thirty years has been the single crowning organizing achievement of our generation of labor organizers. 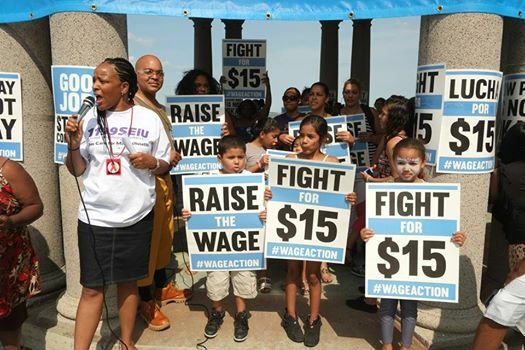 The advances these workers have achieved have been significant, going from minimum wage – or less – to better wages and finally benefits and real protections. At the same time the gnawing problem for unionized homecare workers continues to be their relatively low wages, partially because of the complicated matching requirements of state and federal reimbursement dollars bumping up against the impacts of the Great Recession on state budgets across the country. A major national campaign by SEIU, AFSCME, and other unions representing homecare workers willing to move contract wages across the country to $15 per hour would be huge both within the unions and in changing the way the American public sees the legitimacy of the demand. Campaigners have done a good job of moving some of the perceptions of fast food workers from a picture of entry level teen jobs to a recognition that many older workers with families are now supporting themselves by asking if you want fries with that. With homecare workers there is no confusion. These are inordinately African-American, Latino, and new immigrant women hanging onto the only job many find available and doing the thankless, but vital, tasks of caring for elderly and other clients in their homes. People may like a big Mac or a Whooper, but they love their homecare workers and depend on them for life-and-death care for their loved ones. Real actions of homecare workers on the issue of their wages changes everything about $15 per hour. What was fanciful, becomes real for them. For the unions though there are risks. Greenhouse reports grousing within SEIU that leadership have spent millions trying to see a new jurisdiction in fast food, when their own members are low paid. Wrong whine, but fair complaint. SEIU – and other unions – need to invest significantly in organizing new jurisdictions. And, the emperors have to wear real clothes. Recently, NYU Professor Ruth Milkman’s painful comments on the fast food campaign flatly stated that, “While that’s a very visible campaign, they have yet to organize.” Ouch, even though her words had the ring of truth. For homecare workers and even many janitors and security workers, all of which are the heart blood of SEIU, a real fight to get $15 per hour on the job under all of their agreements would upset the symbiotic relationships with politicians, employers, and legislators that often has been the key to winning the organizing rights and the contracts in the first place. If this first step by thousands of homecare workers triggers real movement and a real campaign among the half-million union members for higher wages finally, that’s not only a real campaign and real organizing, but finally we could have a gamechanger in moving lower waged workers up to something approaching a living wage.